I was around 15 when 802.11g first became widely available affordable and I immediately had preconceived ideas that stuck with me for quite a few years until I started digging into the nuts and bolts last year. Arguably they weren’t terrible notions but certainly a bit utopian. These notions led to some pretty fundamental errors in my early home network design that still semi-exist until I fly back to England next year and revamp my parent’s home network. If it’s connected at 54mbps (802.11a or g) that’s still only half a standard ethernet connection!, I’ll take that! Wrong! Even a decade on despite the immense improvements to Wireless it is still only half-duplex which means it cannot send and receive information on the same stream simultaneously without investing some serious time and money into additional antennas and hacking chipsets. This means my 54mbps connection is effectively halved to 22 mbps before I’ve even selected a file to transfer and assuming there’s no-one else using the medium (Wireless connection) near me. 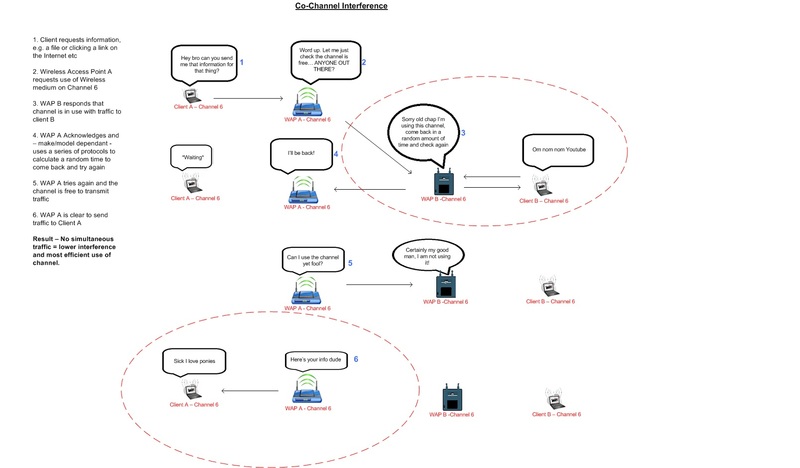 If channels 1, 6 and 11 are being used by my neighbours I could at least use channel 3 to avoid *some* of the interference and that’ll be better for everyone! I’m afraid not younger Ric. 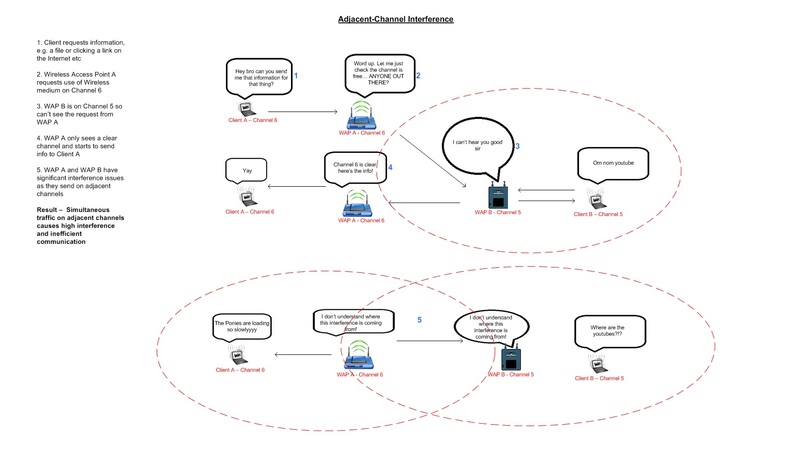 That was a nice idea you had after reading that only channels 1, 6 and 11 would not interfere with each other but by placing your Access Point on channel 3 that means the neighbour’s APs operating in channels 1 and 6 can’t see/speak to your AP at all and as far as they’re concerned, you all won’t know each other exists. This leads into something called (Figure A) Adjacent-Channel Interference (ACI) and is actually worse than (Figure B) Co-Channel Interference (CCI)! 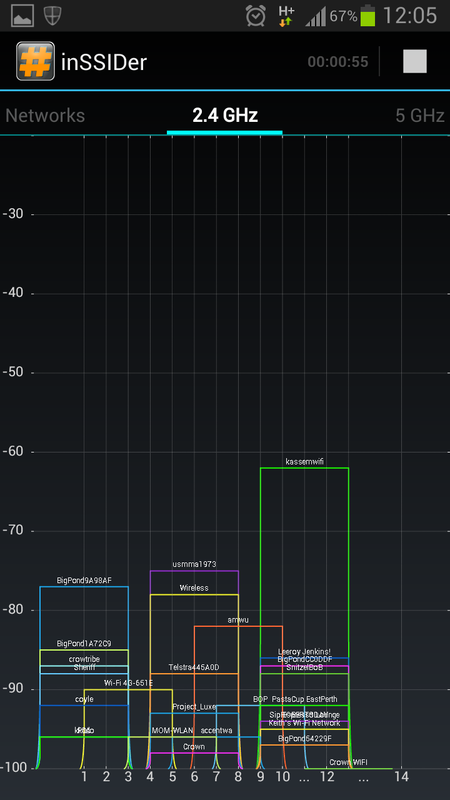 This is a prevalent problem in homes, offices, cafes and just about anywhere; with the 2.4Ghz unlicensed spectrum being limited to just three – four if you live in Japan – non-interfering channels it’s difficult to co-exist with your neighbours in harmony let alone a group of shops and cafes offering free Wi-Fi next to each other. Imagine then what is going to happen in a large office with 30+ APs all trying to play nice with each other. The solution: upgrade all your equipment to 5Ghz as soon as you can to utilise the 23 (country dependant) non-overlapping channels which is a bit easier in your home but for a Cafe who has no control over what devices their patrons use and for an office that supports BYOD that’s extremely difficult. I’ve done a brief scan on 3 different residential homes this week and detected zero home routers using the 5Ghz band and the channels, and the 802.11n standard that runs in it, have been around for years. As Scott Stapleton points out in his post, we all expected things to have moved on a little quicker by now. As you can guess I’m going to split my assumptions into two parts with Multiple Input Multiple Output (MIMO) technology and client capabilities covered in the next part. I’ll sign off with a picture I took a couple of months back when I loaded up inSSIDer on my Galaxy S3 at a local cafe. After reading this post it should help with realising just why you should move to the 5Ghz spectrum as soon as possible if you can.